North Hollywood Truck Accident Personal Injury Lawyers: Over 40 Years of Experience and Trust! Contact us if you have a Truck Accident or Wrongful Death Claim! Our North Hollywood truck accident personal injury lawyers and wrongful death accident attorneys offer expert personal injury legal services. If you or someone you love have been involved in a truck accident in North Hollywood or any other place in Southern California, our experienced truck accident personal injury lawyers will assist you at every step of the way. Our aggressive yet compassionate lawyers and legal counselors have over 40 years of experience in handling truck accident and other personal injury claims for the victim or the victim’s family, especially including wrongful death victims. Our North Hollywood personal injury lawyers also provide legal services for car accidents, motorcycle accidents, uninsured motorist (UM), underinsured motorist (UIM) and wrongful death claims. For more information about our truck accident law firm and experience, please visit our home page and testimonial pages. North Hollywood is a neighborhood in the San Fernando Valley region of the city of Los Angeles, California. The Lankershim Ranch Land and Water Company established North Hollywood in 1887. It was actually named “Toluca” before being renamed “Lankershim" in 1896 and then finally "North Hollywood" in 1927. According to the Census 2010, the total population of the city is 56, 343. North Hollywood has a significantly diverse population that includes Latinos, Asian Americans, Armenian Americans, African Americans, Jewish, Jamaican Americans, Middle Eastern, Iranian Americans, German Americans, Filipino Americans, etc. California has the second largest metropolitan area in the country and the nation’s largest container port complex with heavy truck traffic lies within the Los Angeles Metropolitan area. Southern California also includes cities like Orange, Riverside, San Bernardino, Imperial, North Hollywood and Ventura with heavy truck travel. Southern California also shares a border with Mexico, making it a very important gateway for international truck trade. According to the Department of Transportation, millions of commercial trucks move goods over the national transportation network each year. This staggering volume of commercial trucks on national highways has been a cause of concern for motorists who need to share congested roads with those trucks. Subsequently, the risk or threat of wrongful death or catastrophic injury because of truck accidents has increased. Driving while fatigued, using mobile telephone devices and texting, etc. Our personal injury lawyers and Law Corporation offer legal counseling if you or your loved ones were involved in a truck crash, personal injury claim or wrongful death claim in North Hollywood, Los Angeles, Studio City, Burbank, Glendale, Pasadena or elsewhere in California. 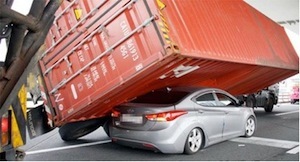 Contact our truck accident injury lawyers and our legal team now for a FREE CONSULTATION and case evaluation. You can speak with an experienced truck accident injury lawyer or any member of our legal team at 818-222-3400 (after hours, please press 1). You can also call us on our Toll-Free number at 866 INJURY 2 or 866-465-8792 (after hours, again please press 1). You can also easily Contact Us by clicking here or by emailing us at info@WalchLaw.com! There is no one more qualified, experienced and caring to handle your personal injury claim or wrongful death claims than our Truck Accident and Car Accident Personal Injury and Wrongful Death Lawyers! Get in touch with us for your FREE Consultation. You will be very glad that you did!